Last month I had the incredible privilege to photograph a trio of siblings for a commission, someone who had sought after my style and imaginative images. After being contacted I preceded to brainstorm with the family and we determined that the children's sense of adventure should definitely be the focus of the shoot. From there, I formulated some ideas for concepts and we entered a phase of gathering props/wardrobe. Having a client that is on board with your vision has to be the most rewarding thing, and I am super thankful to the parents for putting forth equal effort to make this shoot a success! After our adventures on the boat, we moved to another set. But before we moved on, I had to consider the necessity of children to have some breathing room and... well, FUN! So, as I do with all shoots involving kids, we played a game of Simon Says (I wanted to play ninja, but the 4 year olds didn't quite have the attention span to learn a new game!). It is important to be able to level with your subject in any setting and so for kids I find it important to give them the attention and freedom they need to naturally express their young spirit. Not to mention that Simon Says is a great transition into getting them to listen when you direct them in a shoot. After a tough game of Simon Says, lead by the younger brother, we moved on to our American Indian inspired set. 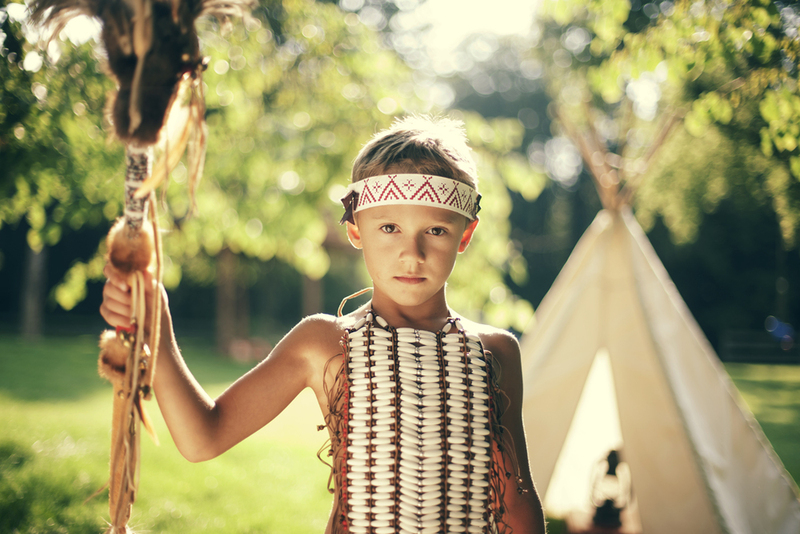 I was THRILLED to do a native inspired shoot with the kids, complete with some pretty awesome authentic wardrobe. The location I'd scouted was framed beautifully with an arching tree and some taller grass, reflecting a meadow that travelers back in the day may have passed through to stay for an evening. Once again, the parents came through like champs providing these beautiful teepees- one for each child! Once again, our time spent in one location had to be pretty short, so while I photographed each child I had the other children play in the nearby tree. As their mom changed each outfit, I would work with each child individually, and then once all three were ready I gave them each roles to play in the large scene we had planned. I made an expansion of this shot and after about 5 minutes of shooting we called that set a wrap! At this point, we just had a few more photos we wanted to acquire, and so we headed out on the family's golf cart to the forest for another adventure! At this point, the kids were close to their finishing point so we kept things simple and quick- just some sweet portraits of the kids engaging with each other and their surroundings! Working with this family was a great reminder of how pursuing what you love can be such a huge reward. Even beyond the fact that I was being approached as an artist, and not just any photographer, I got the opportunity to experience a beautiful family that pours out love to their children and that encourages and nourishes imagination in their beautiful kids! After the shoot, I was invited to join them for dinner and a round of video games, and of course I accepted! For me, photography is an opportunity to connect with people around me and to encourage joy/imagination/kindness in the world. I'm thankful when I get to work with like minded people! If you're interested in hiring me for a commission, or learning more about my process through a workshop, please head on over to my contact form and drop me a message!